Sabeena Karnik is wearing a cotton-silk jumpsuit, brass earrings, both by Payal Khandwala, Mumbai. Call it serendipity or what you will…. A name that crops up at work and is researched extensively makes me rewind to the last Independence Day when the bright Google Doodle had caught my eye. The creation showed the Parliament House in saffron, the Ashoka Chakra, flanked by two peacocks, India’s national birds, in shades of blue and green. I remember noticing that this form had been intricately quilled. 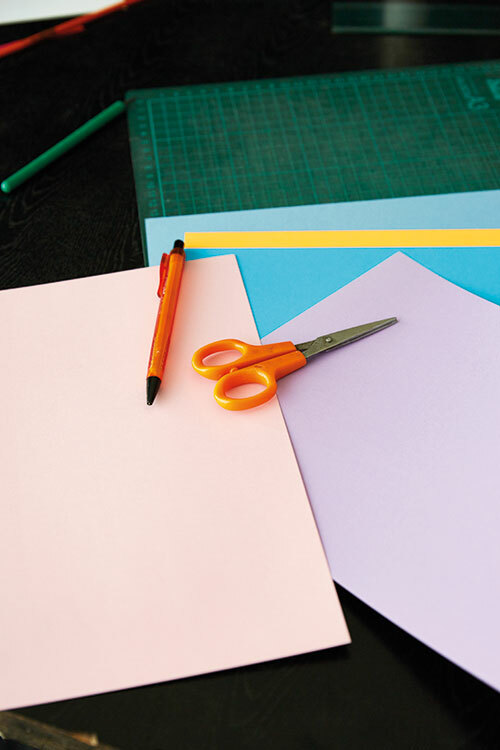 Having read about a hedgehog’s prickly quills and a writer’s elegant quill, I dive into the creative world of an artist who shapes paper to her will, bending it to the sway of her imagination. 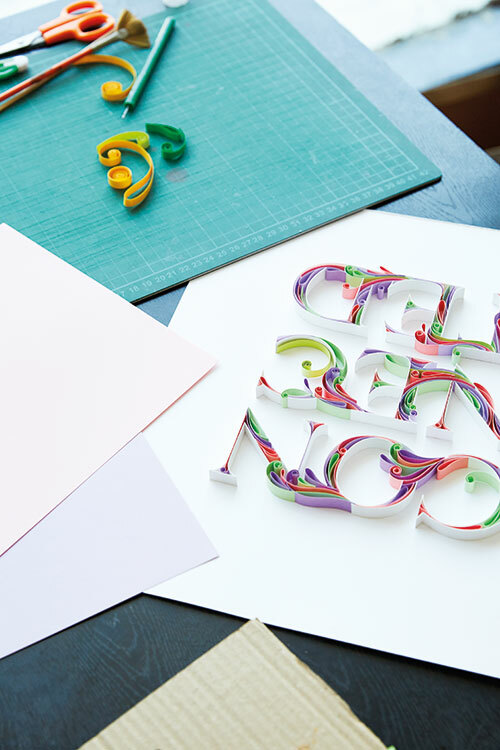 I learn more about quilling, the art form that is also known as paper filigree. It has been chronicled how during the Renaissance, nuns and monks would roll gold-gilded paper remnants trimmed during the bookmaking process, and use them — as a substitute for costly gold filigree — to beautify religious objects. It later became a polite pastime of young ladies in 18th- and 19th-century England. The practice is supposed to have spread across the Atlantic with the colonisers, who used it to embellish their home decorations. The art needs a lot of patience. 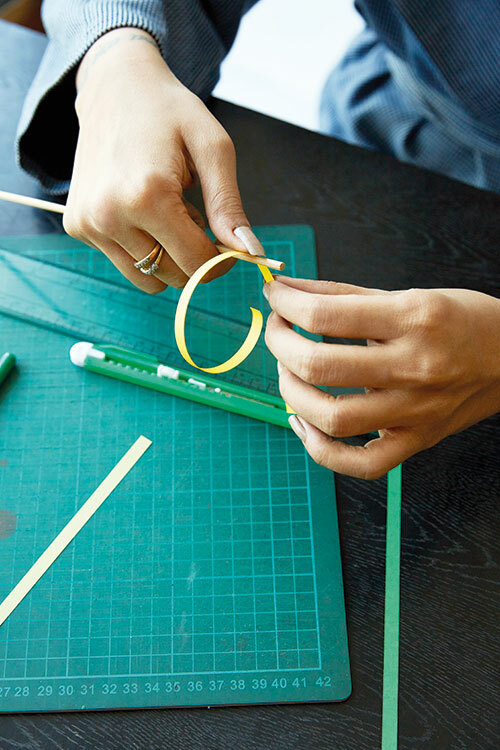 Strips of paper are rolled into coils, pinched into shape and then glued together in different ways to create decorative designs of differing details, shapes and sizes. It is largely done as a hobby or used to decorate gifts, but Sabeena has made it her profession and garnered attention and assignments, predominantly from overseas. Meeting Sabeena for the first time in her suburban Mumbai home, I sense the quiet that envelops her simple abode. She ushers us into her bedroom that functions as her workspace as well. It’s neatly organised, with not a scrap of paper — the tool of her trade — on the floor. On a cupboard alongside the wall she has lined up boxes (which she makes herself) with some of her work. 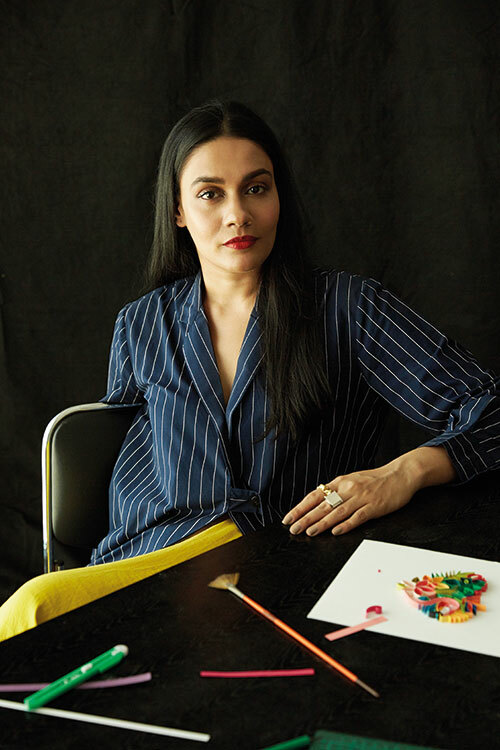 Sabeena Karnik is wearing a knit top, from Zara; twill trousers, from Massimo Dutti; Luminous Fairy necklace, from Swarovski; glitter leather heels, from Jimmy Choo. All in Mumbai. Sabeena Karnik is wearing a cotton shirt, from Lovebirds, New Delhi. Twill trousers, from Zara; Land of Hope earrings, from Swarovski; glitter leather heels, from Jimmy Choo. All in Mumbai. For her, the starting point of success perhaps was the Tanishq assignment. It helped her to get more jobs. Among the clients in her kitty, apart from books like What A Great Word! by Karen Moore, are names like Google, Instagram, Ulta Beauty, Crains Chicago Business, Star Tribune, American Olympic Swimming 2016, Southern Living magazine and Spar supermarket. 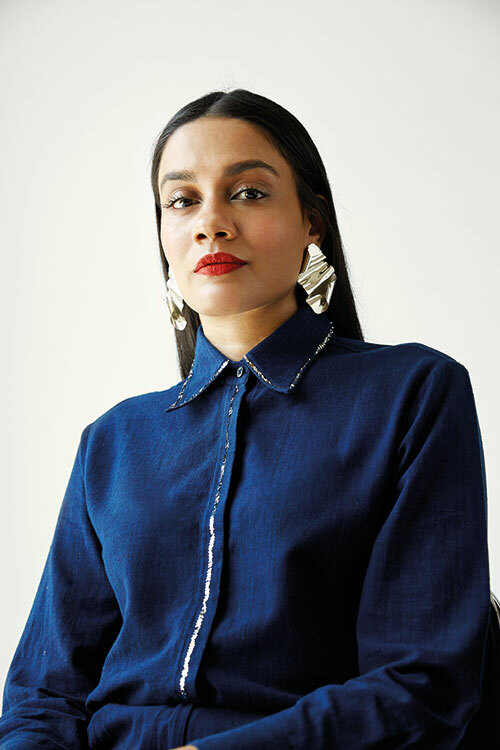 Sabeena Karnik is wearing an indigo khadi shirt, by Rashmi Varma; Foil earrings, from Studio Metallurgy; both in New Delhi. Once a job is assigned, her process, she says, is very basic: “I send them some sketches done with pencil. I give them a lot of ideas, they zoom in on what they like and ask me to fine-tune it. Sometimes they bring up my past work as a point of reference. 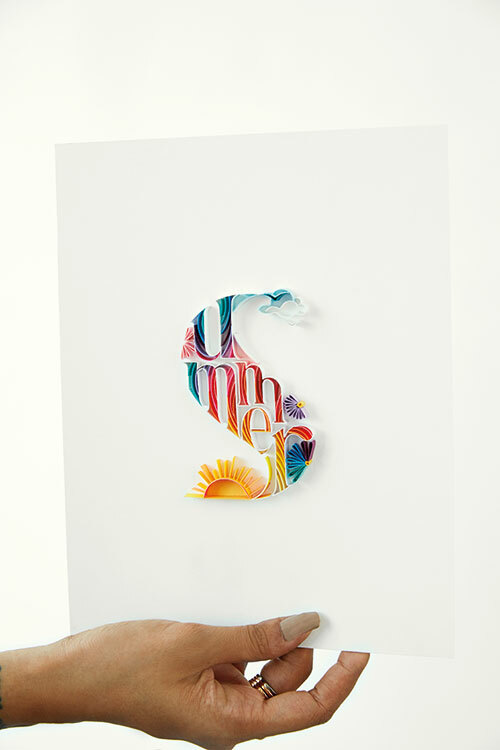 Usually, clients like to see images of the work in progress because that gets them really excited.” When it is done, she has photographs sent to the clients which they use in different ways like the stationery brand Papyrus has done. At times, the clients ask for the original creation. But more often than not, her masterpieces are at her home, stored away in her boxes. 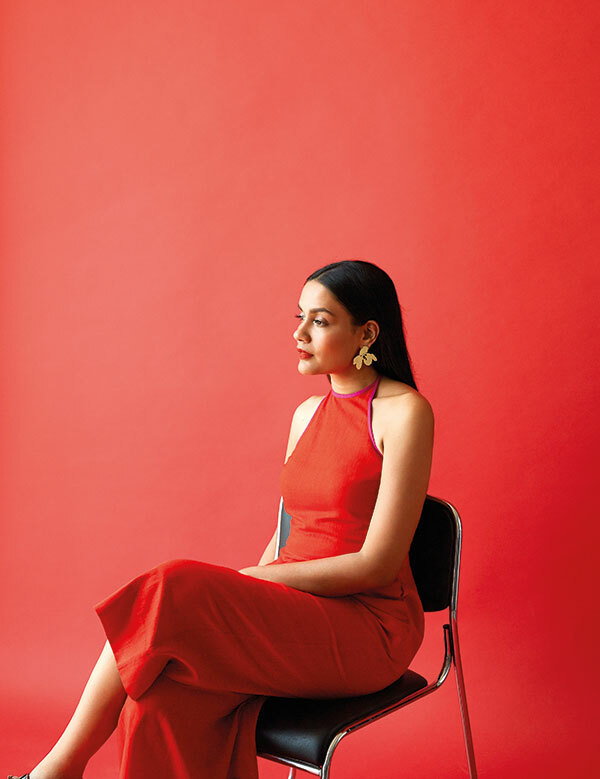 Sabeena Karnik is wearing a cotton top, from Lovebirds; linen skirt, by Payal Pratap; Molten Coral ring, Mobius Twist Sculpture ring, both from Studio Metallurgy. All in New Delhi.